Welcome to the freakiest show on Earth! Sit back, relax, and enjoy this line up of human anomalies. 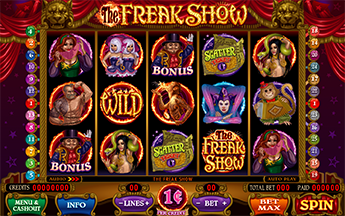 See the Siamese Twins, Strongman, Snake Lady and Fire Breather stacked on the reels! Play the bonus game and match one of four featured entertainers. Multiple matches can also happen with the help of the Bonus Wild Card! Get admittance to Free Spins at 2x pay when 3 or more Ticket Symbols land anywhere on the reels! Both the Main Game and Free Spin games have stacked symbols. 3 or more Ring Master Symbols in any position triggers the Match Bonus Game. Keep picking from 16 stars until you match 3 performers. The wild icon can count toward multiple matches! Win up to 375x your total bet. 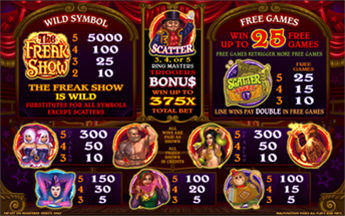 3 or more Ticket Symbols in any position award up to 25 Free Spins with a 2x multiplier on all line wins. Free Spins can be retriggered.